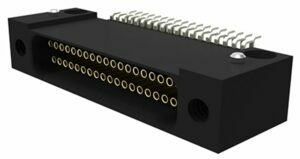 Ulti-Mate Connector has announced a complete, new line of Nano Connectors built in accordance with the specifications of MIL-DTL-32139. Ulti-Mate’s Nano connectors are the only connectors in the industry that are available in both metal shells as well as plastic shells. The complete range includes PCB Mounting with through-hole versions and conventional SMT versions (in right angle and vertical). Ulti-Mate’s SMT Nanos utilize a flat surface mount lead, not a solid round wire, that has to be bent and formed into an axial lead. This allows Ulti-Mate SMT Nano to achieve the greatest degree of co-planarity in the industry. “Precision forming allows us to provide an integral PC tail eliminating the need for crimping a solid wire in place which effectively eliminates crimp resistance issues,” said Steve Brockman, Ulti-Mate Connector’s Vice President. For cable applications standard wires can be offered or, if required, customer wires/cables can be attached to suit. 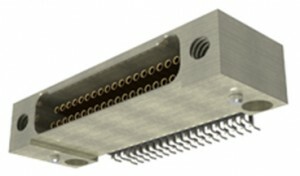 The connectors are available in both single and dual row for wire-to-wire, wire-to-board, and board-board. The contact arrangements are from 9 to 65 contacts and are rated to one amp. The design also allows the maintenance of consistent spring rates while lowering insertion forces and providing longer mating life cycles. The connectors have a standard operating temperature of -55°C to +125°C. However, for high temperature applications (such as down-hole tools in the oil and gas industry), the temperature range can be increased to either +200°C or +240°C. Typical applications are in the defense, avionics, UAV and space markets. In design applications where extremely small interconnects are needed, such as medical, surveillance and geographical exploration systems, Nanos are also used.